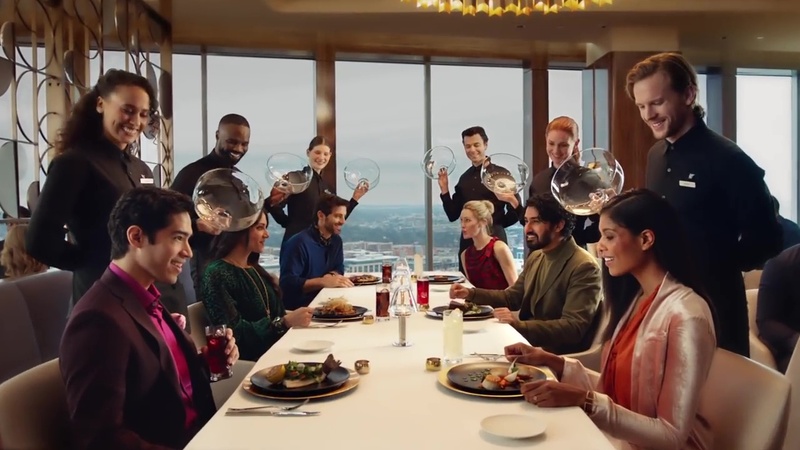 A scene from Marriott Bonvoy's Oscar ad directed by Jean-Pierre Jeunet of Independent Media. While preliminary numbers indicate that the Nielsen ratings for last night’s (2/24) Oscar telecast are slightly up from the prior year, the cost of a :30 timeslot on ABC to sponsor Hollywood’s biggest night was about the same as in 2018, coming in at an average of $2.2 million. Whether or not advertisers got their money’s worth remains to be seen but a couple of trends were evident in this year’s crop of ads, most notably tapping into auteur filmmakers on different fronts, among the notable entries being a :60 version of the Ridley Scott-directed short film Seven Worlds for Hennessy X.O. out of DDB Paris. Complementing the idea that “Each drop of Hennessy X.O. is an Odyssey,” the Academy Award-nominated director of the films The Martian and Gladiator as well as breakthrough films Alien and Blade Runner, created a visual journey that explores the seven flavor profiles in a surreal, sensorial and immersive narrative. Produced by RSA, the film is a creative interpretation of each of the seven tasting notes, described by Hennessy’s Comité de Dégustation as illustrations of Hennessy X.O’s taste and feel: Sweet Notes, Rising Heat, Spicy Edge, Flowing Flame, Chocolate Lull, Wood Crunches; culminating in Infinite Echo. The Seven Worlds production team included VFX house Moving Picture Company (MPC), which previously collaborated with Scott on the films Alien, The Martian as well as Blade Runner. Composer Daniel Pemberton, who previously worked on Scott’s films All the Money in the World and The Counselor, created The Seven Worlds score. Meanwhile Marriott Bonvoy--the new loyalty platform taking the place of Marriott Rewards, The Ritz-Carlton Rewards and Starwood Preferred Guest program--unveiled a minute commerical pod during the Oscar telecast, billboarding its airing with the “Travel Inspires Film/Film Inspires Travel” theme, noting on screen that the work we were about to watch was directed by Oscar nominee (for Amelie) Jean-Pierre Jeneut. Produced by Independent Media, the Marriott Bonvoy fare was out of agency Observatory and shot by two-time Oscar winning cinematographer (Schindler’s List, Saving Private Ryan) Janusz Kaminski (who is also on Independent Media’s directorial roster for spots and branded content). Rolex also aired its Oscar sponsorship campaign which featured luminary directors Martin Scorsese, Kathryn Bigelow, Alejandro Inarritu and James Cameron on-camera writing letters to filmmakers of the future. And for movie-goers, a promo for the next Scorsese film, The Irishman, made a big impression on Oscar night. With a cast headlined by Robert De Niro and Al Pacino, The Irishman is another high-profile Netflix project. Hollywood themes were pervasive in the Oscar ad derby, with Google’s campaign tapping into classic movies, including a spot where an online mobile search for a nearby comfortable hotel yielded the Bates Motel of Hitchcock Psycho infamy. Walmart’s Oscar campaign took viewers onto movie sets and location shoots, breaking away to the often unsung behind-the-scenes crew members--the real stars whose fashion is “styled” at Walmart. Aside from the Hollywood motif, aspirational fare was also evident during the Oscar telecast, including a “Dear Tech” IBM spot which implores us to “put smart to work” to make a better world. In this same vein, Samsung ran a spot, which debuted earlier in the month, in which the company’s developing technology is being used to do wondrous things, including a mobile device which allows a couple to see their unborn infant via ultrasound, and a tattoo artist who remotely creates an intricate design on a young woman. Sam Pilling of Pulse Films directed for Leo Burnett, Chicago. Helping to drive this anthem piece is a classic tune. Leo Burnett, in collaboration with music house Human, reintroduces a recording of “Que Será Será” to a new audience by remixing it with booming bass and hi-hats underneath. The team played with multiple genres of the classic song but creative instincts led them back to the magical charm of Doris Day accompanied by Frank De Vol and his orchestra. Day’s voice brings joy to the characters singing along. Client Hennessy Thomas Moradpour, Michael Aidan, global CMOs; Antoine Varlet, global CMO deputy. Agency DDB Paris Alexander Kalchev, executive creative director; Pierre Mathonat, Alexis Benbehe, creative directors; Quentin Moenne Loccoz, TV producer; Xavier Mendiola, managing director. Production RSA Films Ridley Scott, director; Debbie Garvey, EP/producer; Dariusz Wolski, DP; Kai-lu Hsiung, managing director; Raymond Kirk, 1st AD; Marc Homes, production designer; Charlotte Law, costume designer; Polly Earnshaw, makeup. 75 Paris Emmanuel Guiraud, managing director; Annabelle Fournier, exec producer. Stillking, Prague Lida Ordnungiova, producer. Editorial Jim Weedon, editor. VFX MPC London Carsten Keller, head of CG; Ryan Jefferson Hays, creative director; Boyo Frederix, 3D supervisor; Rod Norman, 2D supervisor; Selcuk Ergen, head of FX; Tomek Zietkiewicz, producer. (Toolbox: Nuke, Nukestudio, Maya, Arnold, Houdini) Sound Production The, Grand Central Recording Studios Daniel Pemberton, composer; Oliver Tarney, sound designer; Jerome Alquier, head of music; Raja Sehgal, sound mixer. Color Company 3 Stephen Nakamura, colorist; Mark Huffam, supervising producer. Client Nike Agency Wieden+Kennedy, Portland, Ore. Jason Bagley, Eric Baldwin, executive creative directors; Alberto Ponte, Ryan O'Rourke, creative directors; Alexs Romans, Emma Barnett, copywriters/art directors; Shelley Eisner, broadcast producer; Cole Davenport, production coordinator; Jake Grnd, Krystle Mortimore, eecutive producers; Matt Hunnicutt, Mike Davidson, heads of production. Production Somesuch Kim Gehrig, director; Sally Campbell, Tim Nash, managing directors; Nicky Barnes, exec producer; Suzie Grenne-Tedesco, line producer; James Laxton, DP; Laura Hegarty, head of production; Courtney Nolan, production supervisor; DeeAhna Hernandez, assistant production supervisor. Editorial Joint Editorial Peter Wiedensmith, editor; Vanessa Yuille, Trevor Schulte, Kristy Faris, assistant editors; Shada Shariatzadeh, Jen Milano, post producers; Leslie Carthy, exec producer; Patty Brebner, head of production; Noah Woodburn, Natalie Huizenga, sound designers. VFX/Post a52 Pat Murphy, VFX supervisor; Adam Flynn, Richard Hirst, Rod Basham, Joey Brattesani, Andy Davis, Dan Ellis, Kevin Stokes, 2D VFX artists; Kevin Stokes, James Buongiorno, Sam Kolber, online editors; Michael Steinmann, Jillian Lynes, producers; Andrew Rosenberger, production coordinator; Kim Crhistensen, Patrick Nugent, exec producers; Jennifer Sofio Hall, managing director. Color Company 3 Tom Poole, colorist; Alexandra Lubrano, color producer; Jenny Montgomery, color assistant. Audio Post Eleven Studios Jeff Young, mixer; Andrew Smith, assistant mixer; Melissa Elston, exec producer; Imani Franklin, producer. Client Marriott International Agency Observatory Jae Goodman, CEO; Stevie Laux, Joe Saroufim, creative directors; Bianca Pettinichi, sr. art director; Carly Allen, sr. producer; Tony Fur, co-chief branding officer; Maddie Avjean, jr. designer; Charles Long, jr. copywriter. Production Independent Media Jean-Pierre Jeunet, director; Janusz Kaminski, DP; Susanne Preissler, exec producer/managing director; Liam Ahern, exec producer. Editorial Arcade Edit Paul Martinez, editor; Dean Miyahira, assistant editor; Damian Stevens, managing partner; Crissy DeSimone, exec producer; Kristen Thon-Webb, head of production; Sarah Schachte, producer. Color Technicolor Mike Hatzer, colorist; Bob Peishel, producer. VFX MPC Jim Spratling, head of 2D/compositor; Benji Davidson, 2D lead; Lexi Stearn, exec producer, VFX; Therese Mayer, producer; Meghan Lang, exec producer, telecine.